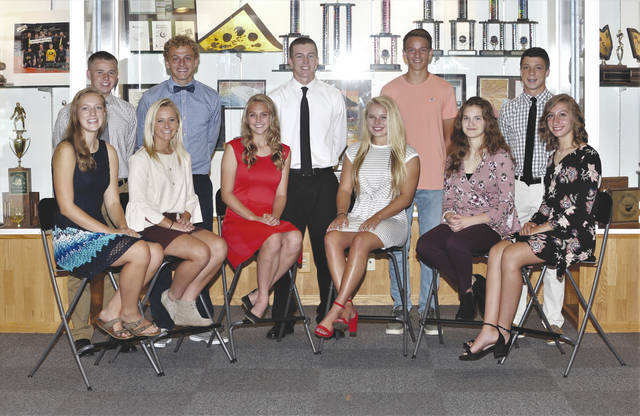 Lee Woolery | Troy Daily News Troy Christian High School has named its Homecoming court candidates for 2018. They include, front row, from left: Abby Baker (12), Riley Spoltman (12), Rachel Plummer (12), Gracie Glaser (11), Hannah Schaffnit (10), and Mackenzie Misirian (9). Back row, Jake Ronicker (12), Grant Conklin (12), Izaak Frantom (11), Garrison Spatz (10) and Jonathan Haddad (9). Not pictured is Nick Baker (12). The Homecoming game will be Friday at 7 p.m. at the football team takes on Ponitz Career Technology Center. The Homecoming court parade and announcement of the king and queen will take place at halftime. The Homecoming dance, themed “Light Up The Night!” will from 8-10:30 p.m. at the Signature Lounge, 845 W. Market St., Troy. Troy Christian High School has named its Homecoming court candidates for 2018. They include, front row, from left: Abby Baker (12), Riley Spoltman (12), Rachel Plummer (12), Gracie Glaser (11), Hannah Schaffnit (10), and Mackenzie Misirian (9). Back row, Jake Ronicker (12), Grant Conklin (12), Izaak Frantom (11), Garrison Spatz (10) and Jonathan Haddad (9). Not pictured is Nick Baker (12). The Homecoming game will be Friday at 7 p.m. at the football team takes on Ponitz Career Technology Center. The Homecoming court parade and announcement of the king and queen will take place at halftime. The Homecoming dance, themed “Light Up The Night!” will from 8-10:30 p.m. at the Signature Lounge, 845 W. Market St., Troy. https://www.dailycall.com/wp-content/uploads/sites/30/2018/09/web1_18-TC-HOMECOMING-2.jpgLee Woolery | Troy Daily News Troy Christian High School has named its Homecoming court candidates for 2018. They include, front row, from left: Abby Baker (12), Riley Spoltman (12), Rachel Plummer (12), Gracie Glaser (11), Hannah Schaffnit (10), and Mackenzie Misirian (9). Back row, Jake Ronicker (12), Grant Conklin (12), Izaak Frantom (11), Garrison Spatz (10) and Jonathan Haddad (9). Not pictured is Nick Baker (12). The Homecoming game will be Friday at 7 p.m. at the football team takes on Ponitz Career Technology Center. The Homecoming court parade and announcement of the king and queen will take place at halftime. The Homecoming dance, themed “Light Up The Night!” will from 8-10:30 p.m. at the Signature Lounge, 845 W. Market St., Troy.